In the 30-year reign of Iran's Islamic Republic, there have been few controversies as serious as the one surrounding the 2009 elections. The votes that brought Mahmoud Ahmadinejad to power for a second term have been challenged, not just on paper, but by citizens taking to the streets in angry protests that have only been quelled by brute force on the part of the establishment. Less well known is the upset that followed Ahmadinejad's nepotistic appointment of Esfandiar Rahim Masha'i, the father of his daughter-in-law, to the post of first vice president. Not long after this, Iran's supreme leader, 'Ali Khamenei, demonstrated his personal authority over the entire political system by forcing Ahmadinejad to reconsider his appointee, leading to Masha'i's dismissal. Masha'i had become controversial for his impolitic references to Israel and America. In a speech at a tourism convention in July 2008, for example, he had observed: "Not only we have no enemy, but we are friends with the American people, with the Israeli people, and we are proud that we are friendly with all the nations in the world." Esfandiar Rahim Masha'i (L) joins Iranian president Mahmoud Ahmadinejad, July 29, 2009. During Masha'i's term as Tehran's deputy mayor, Ahmadinejad became infatuated with him and his apocalyptic ideas. But a controversy erupted after Ahmadinejad later appointed him first vice president. Masha'i was forced to resign at Supreme Leader 'Ali Khamenei's insistence. How did this happen? How did a man holding such views on two countries regarded throughout Iran as the Great and Lesser Satan come to such an important public position? Was something less obvious going on? Why was it so important for Khamenei to risk such a public censure of the president? It is hard to know just what Masha'i intended by his original remarks since they were overtaken so quickly by condemnation and denial. In themselves, they are of little importance since they clearly did not mark any change in emphasis for Iranian foreign policy. It is the incident in its entirety that is of importance, in what it says about the workings of the regime, above all the relationship between the supreme leader and the president. Masha'i was born in November 1960 in the Caspian Sea resort town of Ramsar. His ability to memorize the Qur'an and recite it at religious functions from the early age of fifteen allowed him to develop his skills as an orator. By the time of the revolution, Masha'i was eighteen and was already organizing marches against the shah and distributing Ayatollah Khomeini's decrees and instructions. Upon graduation with an electronics engineering degree from Esfahan Technical University (Daneshgah-e San'ati-ye Esfahan), he joined the Islamic Revolutionary Guard Corps (IRGC) security services. His first posting took him to Kurdistan. While there, Masha'i had the opportunity to meet Ahmadinejad who was then governor of Khoy in western Azerbaijan. Over the years, Masha'i held several posts at the Ministry of the Interior, then as director of Radio Payam, as director of Radio Tehran, and in the national radio and television service. Finally, he was tapped by Ahmadinejad, then mayor of Tehran, to serve as his social and cultural deputy. During Masha'i's term as deputy mayor of Tehran it is rumored that Ahmadinejad became infatuated with him and his apocalyptic ideas. Both Masha'i's connections with the Revolutionary Guards' security forces and his continued involvement in the repression of the Kurds remained as part of his portfolio for several years even when he rose to high office as first vice president. Moreover, Masha'i's daughter is married to Ahmadinejad's son, a union that emerged after years of close friendship between the two families. The association denotes a predilection for domestic connections: Just as Ahmadinejad appointed Masha'i to the post of first vice president (there being ten vice presidents in all), so too, he named his son-in-law, Mehdi Khorshidi, chief of staff—a role Masha'i would take soon after his dismissal from the vice presidency. Masha'i's appointment generated controversy on the one hand because of the way in which it was made, and, on the other, because of a remark almost calculated to arouse anger in a wide section of the Iranian public and the political leadership. With what seems in hindsight to have been extraordinary naiveté, he commented publicly on the nature of Israeli-Iranian relations. Calling the American and Israeli people "friends" engendered apoplexy among clerics and politicians alike. Two hundred deputies wrote to Ahmadinejad condemning Masha'i's remarks, and Iran's parliament speaker, Ali Larijani, criticized the statements independently. Students protested outside Masha'i's office, calling for his dismissal. Masha'i had identified himself with a level of liberalism that could not be tolerated in a regime already under threat from reformists. For the Union of Islamic Students Societies, the removal of Masha'i was a crucial condition for the fundamentalist cause, as outlined in a missive to the vice president himself: "While reaffirming our support for Mr. Ahmadinejad, the best choice for president, we believe that your immediate resignation from the post of vice president would be the only way to serve fundamentalism." Should he refuse to comply, there would be severe repercussions: "You will be on the receiving end of the dire consequences of this appointment." Masha'i reiterated: "I will repeat this a thousand more times, that we love the people of Israel, and I am not afraid of anybody saying that." But, according to Iranian state radio, on the day following his original remarks, he performed a complete about-face, saying, "This is not what I meant and these are all lies. During my speech I also said that Israel was dead and only its funeral ceremony has been postponed, but they [the press] did not publish these statements." By "Israel" I meant the Palestinian and Jewish people living in Palestine, not the immigrant Jews or Zionists because we do not recognize the Zionists at all. It is obvious that Iran cannot be friendly with Zionist usurpators [sic]. Everyone should have understood that I made a mistake by saying we are friendly with the Israeli people while I had the Palestinians in mind … however, as stated by our dear president several time, Iranians have no enmity with the American or the Jewish people, which we distinguish from the Zionists who occupied Palestinian's homeland. Given the alacrity with which he reversed his position, his original statement may have been less significant than commentators have led us to believe. Clearly, something else was happening from the start. If Masha'i's initial remarks signaled a significant departure from the rhetoric customarily issued from Iran, then the response by Ahmadinejad at a subsequent press conference was just as remarkable. It is important to remember that Ahmadinejad has created a reputation for himself as an uncompromisingly anti-Semitic and anti-Zionist politician. His many statements of hostility toward Jews and Israel have acquired notoriety on the world stage. For example, on October 26, 2005, he said "Our dear imam [Khomeini] ordered that this Jerusalem-occupying regime must be erased from the page of time. This was a very wise statement. … Soon this stain of disgrace will be cleaned from the garment of the world of Islam, and this is attainable." Ahmadinejad made a suitably ambiguous statement in response to Masha'i's pro-Israeli sentiments. The ambiguity allowed Ahmadinejad the luxury of demonstrating solidarity with his colleague without departing from the official line. His statement also opened a way for Masha'i to make the shift in position he so quickly did: "Masha'i's word," said Ahmadinejad, "is the administration's word, and it is very clear. Our nation has no problem with people and nations." Although surprising, Ahmadinejad's stance was not unusual, and the events of 2008 were ultimately to prove a prelude for Masha'i's appointment and the ensuing debate the following year. Masha'i's appointment generated an outrage that has emphasized the fragile political balance that Ahmadinejad must now strike between extremist organizations and those others who have rendered smooth his professional passage. It also brought into the open the strain in relations between the president as head of state and the supreme leader as the religious leader and overriding authority in the regime. Ahmadinejad's task is not easy. As a neo-fundamentalist and arch-conservative, he has to carry on a balancing act that will allow him to gain acceptance from the reformist wings of the Iranian state and society. When he was mayor of Tehran, for example, he imposed a religious hard line through which he reversed the reforms that had been instituted by previous moderate mayors. As president, he also came with a mission to roll back the reforms of former presidents such as Mohammad Khatami. His main power base, apart from the Revolutionary Guard Corps, is the I'tilaf-e Abadgaran-e Iran-e Islami (Association of the Developers of Islamic Iran), within which he is one of the most prominent figures. The I'tilaf is one of Iran's most important bastions of conservatism and is so far to the right that it has been described as a fascist movement. Without its support, it is unlikely that Ahmadinejad would have been elected for the first or second time. His far-right position gave him little flexibility with religious and political moderates. In 2005, many of his cabinet nominations were rejected by the parliament. Again, following Masha'i's selection, support for Ahmadinejad was less than forthcoming; for example, the reformist lawmaker Dariush Ghanbari said of the appointment: "Now lawmakers can question Ahmadinejad or even impeach him for this appointment." Much of the concern rests on Ahmadinejad's autocratic nature: Instead of consulting the deputies before choosing his cabinet, Ahmadinejad handed the position directly to Masha'i, a move that elicited "shock" from the conservative parliament speaker Ali Larijani. Likewise, the departure of the minister of information, Hujjat al-Islam Gholam-Hossein Mohseni Eje'i, is said to have followed a verbal confrontation with Ahmadinejad over Masha'i's appointment. Ahmadinejad and Masha'i remained indifferent in the face of strident objections—an indifference that compelled Khamenei to formally request Masha'i's removal by Ahmadinejad. On July 21, the supreme leader wrote to his president: "The appointment of Esfandiar Rahim Masha'i to the post of deputy president is contrary to your interest and that of your government, and it will cause division and frustration for your supporters … We must cancel this appointment." That the supreme leader's unspoken criticisms passed unacknowledged by the president until they were conveyed through a handwritten letter raised questions among traditional conservative allies of Ahmadinejad as to whether the student was ignoring the voice of his master. Nevertheless, Khamenei got his way in the end. Masha'i tendered his written resignation, stating: "Obeying the orders of the supreme leader, I do not see myself to be the first vice president but … I will serve our dear people as best I can." Yet, Ahmadinejad's perceived insolence in the face of Khamenei's request angered many clerics, Majlis parliament members, theologians, and the conservative media alike. 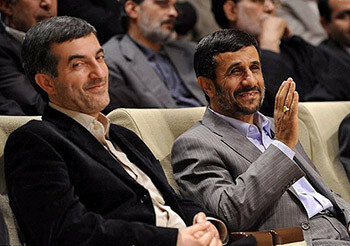 Ahmadinejad greeted early suggestions that Masha'i should resign by asking, "Why should he resign? Masha'i has been appointed as the first vice president and continues his activities in the government." This hinted at an attempt by Ahmadinejad to assert personal whims over the wishes of the supreme leader. Yet the resignation when it came, did not mark the end of the silent antagonism. Ahmadinejad waited one week before passing the resignation letter to Khamenei, along with a brief correspondence that acknowledged the demands of protocol: "Peace be upon you. While sending you a copy of the resignation letter of Mr. (Engineer) Esfandiar Rahim Masha'i … from the position of first vice president, you are hereby informed that in accordance with article 57 of the constitution, the instructions contained in your letter … have been carried out." The brevity of the correspondence came close to expressing disrespect for the supreme leader. Moreover, while Article 57, which acknowledges the supervision of the supreme leader over all governmental affairs, is noted, Ahmadinejad did not mention any compliance on a religious or legal level, rendering his correspondence merely an accompaniment to the attached resignation letter from Masha'i. The issue of Masha'i's appointment and dismissal is only a symptom of a broader malaise afflicting Iranian politics. His attempt to suggest a new démarche for Iranian foreign policy—and on such a sensitive issue—while he was minister for tourism and cultural heritage was clearly misguided and can only have tainted his reputation from that time on. But his rapid turnaround and Ahmadinejad's measured defense of his views served to give him an extended career that only reached its crisis point following the 2009 elections. Nor were Masha'i's remarks about Israel the only matters that cast doubt on his ability to maintain the trust of the religious establishment, something that, in turn, cast doubt on Ahmadinejad's wisdom in appointing him in the first place. Political leadership in the Middle East has long been guided by patrimonial and patriarchal systems. While this framework gives strength to the political system, it is this strength that also provides the weaknesses within a government that relies so heavily on such a system. An example of this simultaneous fortitude and frailty may be seen in the office of the supreme leader, who is central to all policies and programs. While governmental staff may advise, in the end all ideas are attributed to the leader, and any attempt to override his ultimate authority will result in the rapid deterioration of a plucky politician's career. Accordingly, if Khamenei in his capacity as supreme leader represents the hub of power, then Ahmadinejad depends on the patronage of Khamenei. Ahmadinejad in turn risks overstepping his mark at any point since the supreme leader holds real power and, to an extent, controls any future political success for Ahmadinejad. Given the close relationship between Ahmadinejad and Masha'i, it is questionable whether the impetus to remove him arose as a consequence of his not very important statements on Israeli-Iranian relations or whether it carried greater weight as an endeavor by the supreme leader to test the president's loyalty by compelling him to choose between his confidante and his master. Although Khamenei triumphed, some degree of uncertainty emerged from Ahmadinejad's lengthy hesitation. This in turn could prove conducive to a widening rift between the supreme leader and the president in an environment in which nobody is indispensable. Thus, the very system that Ahmadinejad thrives in could equally prove his downfall. Of particular interest is the military dimension. In the case of Iran, this chiefly means the Islamic Revolutionary Guard Corps or Sepah, the religious and governmental henchmen who have the power to silence restless citizens and enforce the whims of the authorities. Since Ahmadinejad took office, the IRGC has demonstrated a fickleness that showed it to be at first aligned with the president until the rift occurred between him and Khamenei. While opting for one over the other was inevitable, given that the IRGC owes its allegiance to the Islamic Republic, rather than to the president, Ahmadinejad nevertheless took a calculated risk; the IRGC had previously supported a number of his earlier political forays against Khamenei. This latest transgression, however, proved too much, and as Iran specialist James Bill and Middle East politics analyst Robert Springborg note, "When leadership rests so heavily upon the military reed, then it must be prepared to collapse whenever that reed breaks." Buoyed by previous support, Ahmadinejad leaned on the reed of the IRGC with excessive confidence and since he ignored the supreme leader, clerics, and lay conservatives alike in his quest to sustain Masha'i's vice presidential role, the IRGC reed finally broke. Choosing the pen over the sword as a means for conveying the switch in allegiance, the political wing of the IRGC, the Sobh-e Sadeq, published an editorial criticizing Ahmadinejad and unmistakably supporting Khamenei in the Masha'i affair. Although the military is a requisite in ensuring the durability of patrimonialist rule, it is fragile, meaning that leaders can be made or unmade at will. In placing too much faith in the mode of governance, Ahmadinejad jeopardized his rule and his future relations with the supreme leader—the repercussions of which will doubtless continue to damage him through what is left of his term in office. As Ahmadinejad enters his second term under a cloud in the eyes of those outraged by the Masha'i affair, he must also contend with the wider discord engendered under his previous term. In recent years, global politics has been marked by the ascension of a series of charismatic leaders who invariably pledge salvation for ailing economies, unemployment levels, and domestic and regional security. Charismatic leaders emerge in times of upheaval, imbuing decaying political systems with a vitality that inspires optimism in an uneasy population. It is fitting, then, that as Ahmadinejad entered the initial presidential race for his first term, Iranian politics were ripe for an extraordinary leader. Ali Ansari, history professor at St. Andrews University, Scotland, U.K., observes that "for the purposes of popular consumption, the myth of charismatic autocracy had to be encouraged." Upon becoming president, Ahmadinejad did bring a charisma that changed the tenor of Iranian politics. Appealing to young and old across the socioeconomic spectrum, he pledged to elevate Iran to new economic and political heights. Yet he was not alone in evoking a charismatic response since the endurance of patrimonialism necessitates new leaders to be attached to "charismatic leaders [who] were accorded supernatural status,"—in this instance Ayatollah Khamenei. Nevertheless, charisma conceals its own fissures; it does not evolve but is forged in periods of crisis or rapid change. For charismatic leadership to endure from one leader to the next, it must conform to a process, whereby successive holders of the charismatic office do so in a formalized fashion, like the popes or the early caliphs. This in turn results in a self-contradictory evolution. According to Max Weber, the early twentieth-century German political economist and sociologist, pure charismatic authority lacks permanence, and thus the very elements that made the original charismatic leadership dynamic now become enshrined within the bureaucratic or patrimonial system. The fresh, original charisma becomes routinized in a more urbane form of leadership. Moreover, the effects of charismatic leadership are questionable: Impersonal, institutional charisma is a basic requirement for organizational stability, and Ahmadinejad has shown a talent for original charisma, yet enters his second term with a much destabilized administration. The Iranian economy is in a terminal state, yet the only salvation for it would involve casualties—in this instance in the form of the Iranian employment market. Of course, Ahmadinejad has not been spared his portion of the blame for the economic malaise; his inability to stop spending during the oil price boom resulted in a departure from rational economic policies and the pursuance of policy by decree that resulted in "the exercise of a royal prerogative which would put the shah to shame." As a result, Ahmadinejad squandered not only the Iranian coffers but also the confidence of the population. Lurching from bad to worse, the damage inflicted on the economy under Ahmadinejad reinforces the reality that the controversy arising over the appointment and dismissal of Masha'i is but the tip of a crisis-infused iceberg and that the decline in relations between Ahmadinejad and Khamenei could be the pressure that will finally break the system within this presidential term. The tenth presidential elections represented a new chapter in Iran's intense intra-elite dispute. No one outside or inside Iran can predict the ultimate outcome. One thing has become abundantly clear: Ahmadinejad's reliance on paramilitary forces to support him in bringing about velayat- e ummat (guardianship of the people) has given way to Khomeini's doctrine of velayat-e faqih (guardianship of the clergy), the doctrinal principle on which the current system rests. In this context, Khamenei is not obliged to uphold international norms of human rights but to help erect a pure and authentic Islamic government while conforming Shari'a to Iran's political and social setting. The removal of Masha'i demonstrated, once more, that the real decision-maker in Iran is the supreme leader and not the president. Blaming Iran's problems on Ahmadinejad would lead us in a dangerous direction by suggesting that those problems will go away when he is finally driven out of office. Reza Molavi is a research fellow at the School of Government and International Affairs and the executive director of the Centre for Iranian Studies, University of Durham. K. Luisa Gandolfo is a research fellow of the Center for the Advanced Study of the Arab World at the School of Government and International Affairs, University of Durham. Iran Press Service (Paris), Aug. 20, 2008. Deutsche Presse-Agentur (Hamburg), Aug. 13, 2008. Deutsche Presse-Agentur, Aug. 13, 2008. Los Angeles Times, July 20, 2009. Asia Times (Hong Kong), Aug. 4, 2009; Middle East Strategic Information, Jerusalem Center for Public Affairs, Aug. 8, 2009. "The Inevitable Clarification," IsraellyCool, July 28, 2008, accessed Dec. 4, 2009. Fars News Agency (Tehran), cited in ibid. Elihu D. Richter and Alex Barnea, "Tehran's Genocidal Incitement against Israel," Middle East Quarterly, Summer 2009, p. 46; Joshua Teitelbaum, "What Iranian Leaders Really Say about Doing away with Israel," Jerusalem Center for Public Affairs, July 1, 2008. Asia Times, Aug. 4, 2009. Sami Moubayed, "Iran and the Art of Crisis Management," Asia Times, Jan. 19, 2006. Ha'aretz (Tel Aviv), July 24, 2009. Los Angeles Times, July 2, 2009. Le Figaro (Paris), July 27, 2009. Le Figaro, July 25, 2009. Guenther Roth, "Personal Rulership, Patrimonialism, and Empire-Building in the New States," World Politics, Jan. 1968, p. 197. James A. Bill and Robert Springborg, Politics in the Middle East, 5th ed. (New York: Addison Wesley Longman, 2000), p. 125. Ali Ansari, "Iran under Ahmadinejad: Populism and Its Malcontents," International Affairs, July 2008, p. 8. Bill and Springborg, Politics in the Middle East, p. 117. Lloyd I. Rudolph and Susanne Hoeber Rudolph, "Authority and Power in Bureaucratic and Patrimonial Administration: A Revisionist Interpretation of Weber on Bureaucracy," World Politics, vol. 38 (1985), p. 195. Edward Shils, "Charisma, Order, and Status," American Sociological Review, Apr. 1965, pp. 199-213. M. Mohajeri, "Ta'adol mahor basheed lotfan," Baztab.com, June 20, 2007, cited in Ansari, "Iran under Ahmadinejad," p. 698. Related Topics: Iran | Winter 2010 MEQ receive the latest by email: subscribe to the free mef mailing list This text may be reposted or forwarded so long as it is presented as an integral whole with complete and accurate information provided about its author, date, place of publication, and original URL.